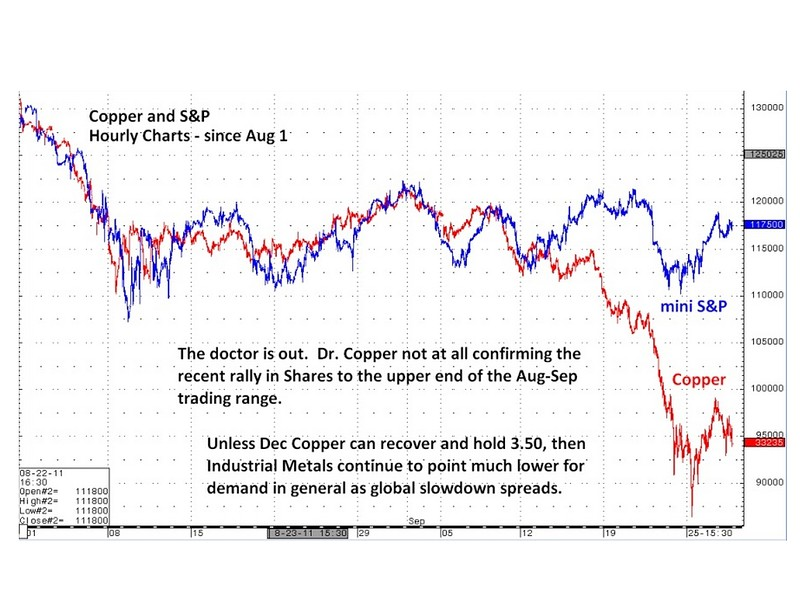 But copper has been getting beaten up for a while, slipping into a bear market more than a week ago. And its message is echoed in the Shanghai Composite index, which hit a new low for the year overnight and is down 22% for its high in April. “This combined with the breakdown in the price of copper pose new risks that a harder economic landing in China could be at hand,” writes Mr. Kass. This technology lets engineers monitor the process as drills run straight down nearly a mile before making a gradual bend to run horizontal about the same distance. This “precision horizontal drilling” is the new technique that’s made it practical to exploit the Marcellus Shale (“fracking” has actually been done in America for decades). In the data-monitoring van with his team of consultants, petroleum engineer Nick Pottmeyer explained fracking. The team slides a device known as a “perforating gun” into the horizontal portion of the well, then uses it to set off small charges that punch pinholes in the horizontal steel production casing. Then, they unclog the holes with an infusion of water and a diluted acid to remove any debris. The acid dissipates as the shale neutralizes it, over a mile underground. Huge pumps drive water mixed with silica sand down into the horizontal leg of the casing — forcing the sand and water through the tiny holes to make hairline cracks in the shale. The microscopic grains of sand “prop” open the cracks, to allow the gas into the well and to keep the cracks from closing. Bottom Line: We now have a proposal for a tax policy – the “Buffett Rule” – based on Warren Buffett’s anecdotal “evidence” of his and his employees’ tax burdens. 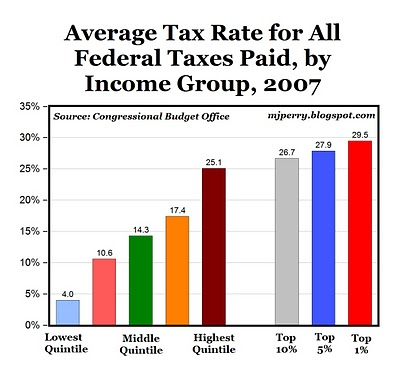 But that “evidence” seems pretty far-fetched and not consistent with: a) average federal income tax rates available from the IRS, nor b) average tax rates for all federal taxes paid, from the CBO. 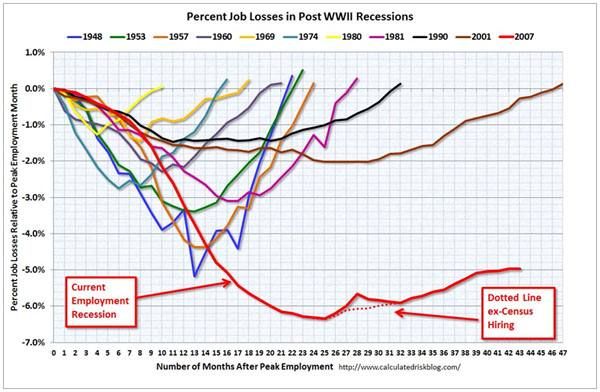 Why this recovery feels different….. Some things even the Obama brain trust doesn’t want credit for. For decades, advocates of ‘peak oil’ have been predicting a crisis in energy supplies. 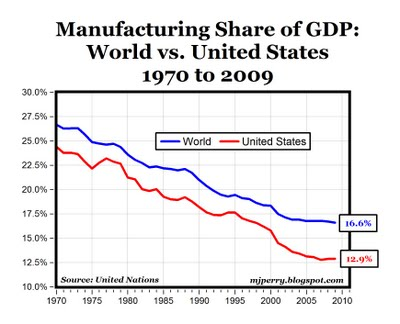 They’ve been wrong at every turn, saysDaniel Yergin. This is actually the fifth time in modern history that we’ve seen widespread fear that the world was running out of oil. The first was in the 1880s, when production was concentrated in Pennsylvania and it was said that no oil would be found west of the Mississippi. Then oil was found in Texas and Oklahoma. Similar fears emerged after the two world wars. And in the 1970s, it was said that the world was going to fall off the “oil mountain.” But since 1978, world oil output has increased by 30%. 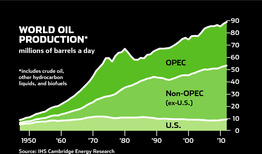 Overall U.S. oil production has increased more than 10% since 2008. Net oil imports reached a high point of 60% in 2005, but today, thanks to increased production and greater energy efficiency (plus the use of ethanol), imports are down to 47%. Household Debt or Structural Change? Both explanations – household debt and construction employment – place the housing boom as central to explaining why employment has lagged during the recession. 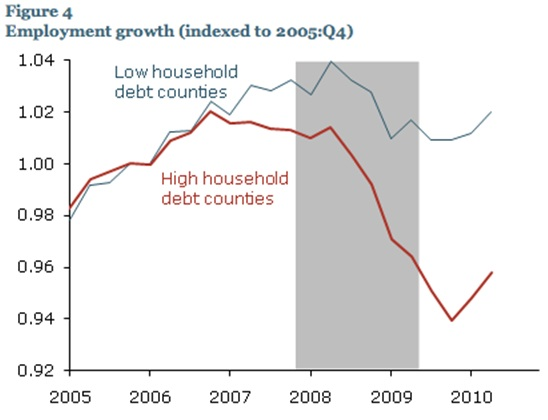 However, the housing debt story suggests the possibility of easy fixes to employment by reducing aggregate debt levels. 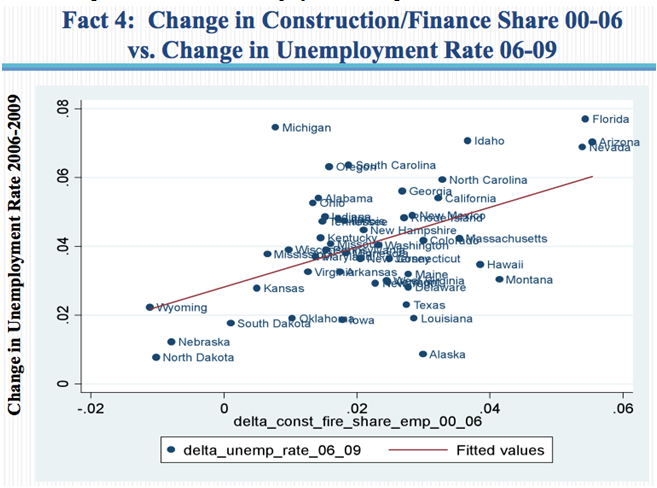 The construction employment story, on the other hand, paints a more difficult picture: employment may have lagged during the recession simply due to the difficulty of retraining residential construction workers for new fields. Figuring out which story better matches the facts is important for figuring out the scope for policies to deal with the unemployment problem. 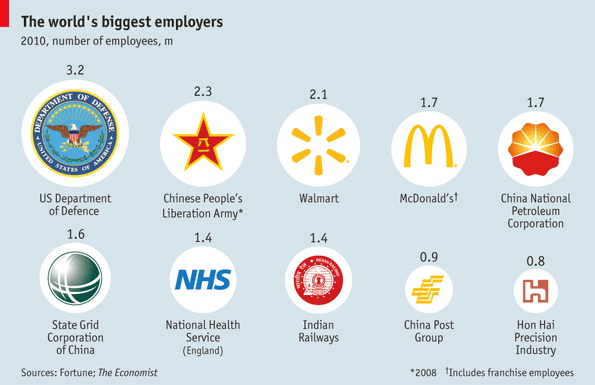 Who are the world’s biggest employers? ONE of the biggest headaches for policymakers in many rich countries has been how to create jobs during a period of fiscal austerity and anaemic growth. 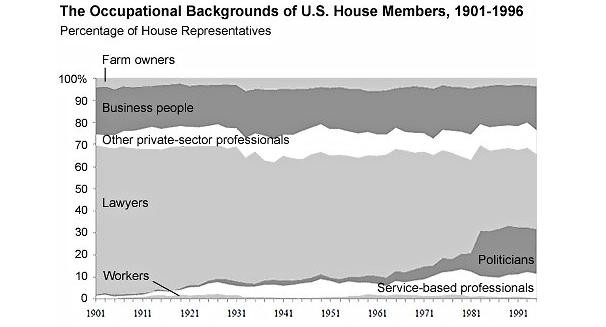 The private sector has been slow to generate jobs, and government-spending cuts usually end up cutting jobs. And governments employ a lot of people: in our chart of the ten biggest global employers, below, seven are government-run. America’s defence department had 3.2m people on its payroll last year, equivalent to 1% of the country’s population. China, the world’s most populous nation and a big military spender, employs 2.3m people in its armed forces. And the number of people working for the National Health Service in England is equivalent to over 2.5% of the country’s population. The three private companies are Walmart, McDonald’s and Taiwan’s Hon Hai Precision Industry Company, a subsidiary of which is Foxconn, a secretive electronics manufacturer. Freight as Passenger Rail’s Worst Enemy — Or Something Else? Though trucking accounts for a larger percentage of freight shipments in Europe, the U.S. actually moves a larger amount of goods (by ton-mile) by road than its European peers (1.7 million ton-miles versus 1.3 million), despite having a smaller population (310 million vs 380 million). How can this be? In order to consume what we consume, Americans rely on goods that are moved longer distances. And U.S. inhabitants are also larger consumers of material goods that require shipping; indeed, the country’s 6.5 million annual ton-miles of freight dwarf the 3.1 million in Europe. Most significant perhaps is the American reliance on coal as an energy source; it accounts for almost half of overall power production in this country, compared to about 16% in Europe overall (and even less in some countries like France and Spain). Related is the fact that Europeans simply consume less energy — less than half as much on a per-capita basis and almost as little even in the wealthiest countries like Germany. For historical and logistical reasons, coal can be moved more efficiently by train, which explains a large share of the difference between American and European freight transport patterns. The coal moved by American railroads alone — about 1.5 million ton-miles, representing 23% of American goods movement — is equivalent to about half of all European freight shipments, according to the Harvard study, based on 2000 information.